NEBO Tools 15-LED Electronic Classic-Style Lantern | BUDK.com - Knives & Swords At The Lowest Prices! This old school LED lantern from NEBO tools fuses vintage style with modern technology for a truly remarkable light source, perfect for rugged outdoor camping trips, charming home décor and everything in between. Powered by 15 ultramodern, energy efficient LEDs, it yields 25 lumens of brilliant white light for up to 96 hours! You won't find a traditional liquid fueled lantern anywhere that can boast a burn-time like that! And best of all, there's no dangerous fumes, no soot to blacken walls, no volatile or potentially harmful chemicals and no acrid "fuel smell," making this electronic lantern ideal for stylish, rustic indoor lighting. Of course, it's also great for outdoor activities. The LED lantern's long run-time and ultraportable battery power source means you won't have to reserve precious, limited space in your gear for bulky, flammable fuel canisters. It requires just two D batteries (not included), a week's supply of which easily fits in a small zip-top sandwich bag. Like a traditional lantern, you can adjust the LED lantern's light output to suit different circumstances - low light for a relaxing evening on the patio or bright light for reading a map in the woods at night. A reflector is positioned above the LEDs to cast the light evenly in all directions. 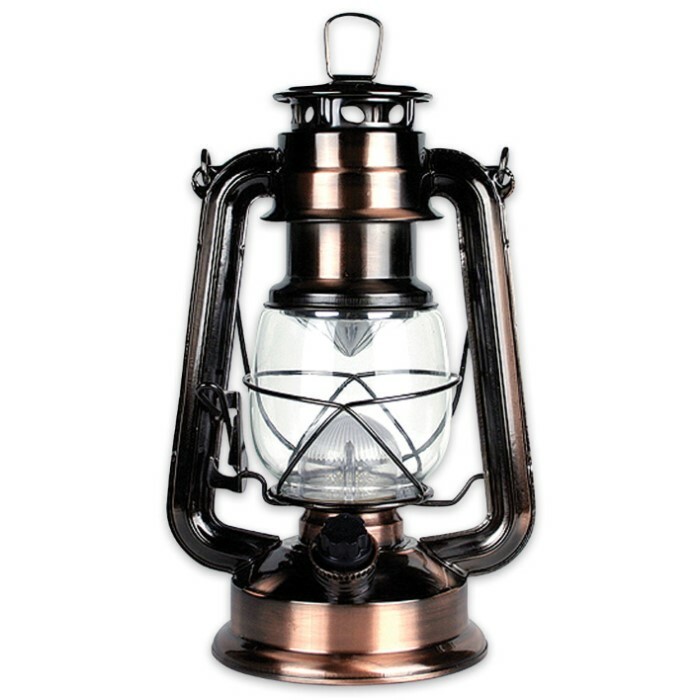 Built from a tough metal alloy and glass (globe), this handsome, durable LED lantern can withstand the elements for years, both indoors and out. A wire guard protects the classic glass globe from breaking. At 9" tall, it's ideally sized for practically any location or application. If you love the graceful, rustic style of vintage kerosene/oil lanterns, but need a more versatile, user-friendly lighting solution, look no further than NEBO's 15-LED Lantern!